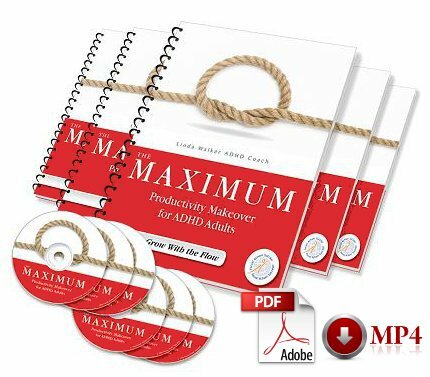 The Maximum Productivity Makeover Program for Creative Geniuses and the Take Charge! programs were developed especially for adults with ADHD. The materials specific to your program are available when you access your exclusive, members-only website only. You’ll be able to access and download the first module of your program instantly as soon as you register. Then once a month you’ll gain access to a new module until you have access to all the modules in your program. We do this because experience has shown that when we deliver all the materials at once it is overwhelming and distracting. Our clients have had much more success when we deliver materials as needed. 14 (Take Charge! Program) or 23 (Maximum Productivity Makeover Program) weekly group coaching sessions of one hour (or an hour and 15 minutes if there are more than 10 participants) spread over a period of 4 to 6 months. Meetings, guided by the coach, are held on a telephone conference line. Each session youhave the opportunity to discuss what you’ve learned, what you’ve applied in your own life, the stumbling blocks you’ve encountered and to make your individual action plan for how you’ll improve your life in the coming week! Session recordings are available the very next day. Never miss a thing, even if you’ve missed a session. 2 one-on-one coaching sessions of 50 minutes (or 4 laser-coaching sessions of 25 minutes). A paper agenda recommended by Linda (a $35 value). The Strengthfinder test from the Gallup Organization will help you identify your strengths (a $40 value). Task Modifier Chart – Master strategies to maximize your productivity, even for tasks you hate. Special “task modifiers” can make any task doable and make you more effective getting it done! Task Analysis Decision Tree – No need to procrastinate when you know exactly how to schedule, systemize, automate or delegate any task for maximum productivity. Planning Activity Poster – This guide to taking control of your life and your time was designed and tested by Creative Geniuses. The only effective “you” management system that works with your unique mind. As you work through this complete “makeover” process addressing every critical area, every subtle element, every productivity killing hindrance, your custom-designed tools and strategies will unlock for you all the success possible as a true Creative Genius. >> More free time at the end of your day (because you got your work done faster). >> More focus and clarity. Perhaps for the first time, see your life — where you are now, and where you want to be – and see that its really possible to get from here to there! >> More time with your family (and the energy and concentration to enjoy that time to its fullest instead of feeling distracted, impatient or tired). >> More energy, more excitement, more passion about everything in your life… unleashing your creative genius is much more fun when you can actually turn your brilliant ideas into concrete results! You’ll learn and apply Creative Genius strategies and specific techniques so you’ll get more done and eliminate wasted time from the very first day. But, this is only the beginning! As you apply the Creative Genius strategies, your own creative idea-generating ability will kick in so you’ll continue to discover new and better ways of doing things, giving you even more free time, more clarity, more excitement, and more success in all areas of your life. Imagine how it will feel to be on an UPWARD spiral!